ScanSnap Evernote Edition: Buy It Or A Normal ScanSnap? >> ScanSnap Evernote Edition: Buy It Or A Normal ScanSnap? Like most things in life the answer is “it depends”, but I won’t leave you hanging. This guide will hopefully help you make a decision one way or the other. They look pretty similar, right? Hardware-wise they’re the same. The ScanSnap Evernote Edition is basically an iX500 with a green light and a more Evernote-y design. Fortunately the iX500 is a great scanner, so it’s a win either way. So with the hardware being a wash, the main difference comes down to software and workflow. If you are a heavy Evernote user and plan to stay one for a long time, the ScanSnap Evernote Edition has some great features. The marquee feature is it will try to recognize the type of document you are scanning, and will then automatically file it away to the Notebook and Tag that you specify. So you can have Receipts go to one Notebook, Business Cards go to another, Documents to another, etc. 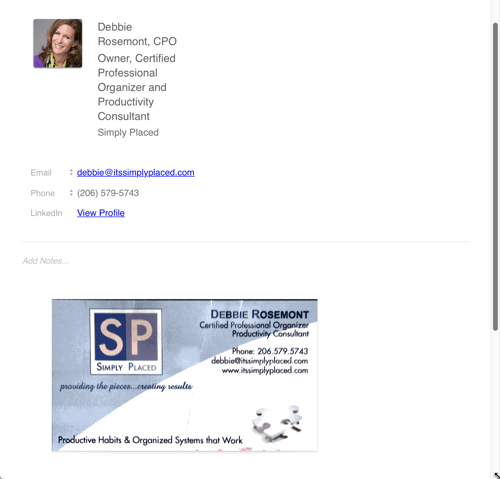 Speaking of Business Cards, it has a pretty nice feature if you connect the Evernote software with your LinkedIn account. 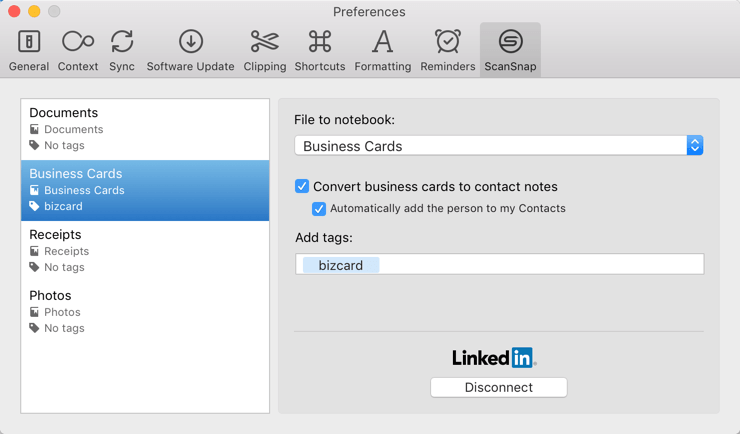 When you scan a business card it will look the person up on LinkedIn, pull some of the data, and create a nicely-formatted Note for you with the card and the person’s contact information. The nice thing about the ScanSnap Evernote Edition is that it is simple to use, especially if you are familiar with Evernote. You scan, your documents appear in Evernote, and you go from there. To me, the ScanSnap Evernote Edition’s main advantages (simplicity and Evernote integration) are also its biggest drawbacks. It’s awesome if you want to scan to Evernote, but what if you want to scan somewhere else other than Evernote? Or what if you decide someday to stop using Evernote altogether? You do have the ability to scan to a folder on your computer, and you can use the ScanSnap Evernote Edition to NOT upload to Evernote, but that is a bit fiddly and everything still has to go through the Evernote software. Also, at the time of writing, the ScanSnap Evernote Edition is only available directly from Fujitsu since Evernote killed its Market. Your purchase and return options are much more limited. With all this said, why might you want to consider a “normal” ScanSnap like the iX500? The main advantages of the iX500 and similar models is flexibility. You can scan to Evernote very easily, but you can also scan to any other piece of software or location. You can create pre-defined Profiles to automatically scan to all sorts of locations with all sorts of settings. 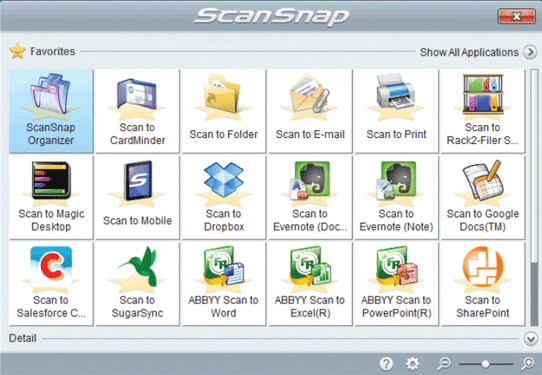 Click here to learn more about scanning to Evernote and setting up Profiles with the ScanSnap. The “normal” ScanSnaps are also available through Amazon and all sorts of retailers worldwide. At the time of writing, the iX500 is $410 on Amazon vs. the ScanSnap Evernote Edition’s $495 from Fujitsu. If you want to scan to Evernote, it is easy with the iX500 but not as seamless as with the ScanSnap Evernote Edition. You have to either choose an Evernote Profile when you scan, or hit the Evernote button on the Quick Menu. The ScanSnap software doesn’t have the document auto-detection features that the ScanSnap Evernote Edition does. You can fake it by setting up Import Folders on Windows or using Automator or Hazel on the Mac, but it is certainly not as simple. To answer a question many of you are going to ask: no you can’t use the ScanSnap Evernote Edition’s software with an iX500. If you’ve found a way to do it, please leave a comment. So Which Scanner Should You Use To Go Paperless? At the start of this piece, I said “it depends”, which I recognize is a cop-out, but it’s the truth. If you are a heavy Evernote user and you are planning to use Evernote for a long long time and don’t have any worries about it going away, the ScanSnap Evernote Edition is certainly an easy to use scanner. For me, I prefer flexibility so I generally point people towards the iX500 or other ScanSnap models. It can still scan to Evernote, but it can do so much more and you are not locked into any particular platform. Do you have one or the other scanner? How do you like it? Did I miss any Pros or Cons? Leave a comment and let us know. I've been paperless with the ScanSnap since 2008, and have collected my best tips and strategies into this free cheat sheet. Enter your email to let me know where to send it, and I'll get it to you right away. You'll also receive paperless tips every two weeks via the very popular Paper Cuts. I value your privacy and your information is never shared with anyone. Yes, you can easily buy the best edition of the Evernote and that will have cost normal as that is already fixed it price normally so for that reasons you can generally be used it for the good experience for more contact Hp printer support. Does anyone know if the Evernote edition can be used with the new ScanSnap Cloud software? I have the Evernote Scansnap for my mother to use. But here’s my problem. When I scan multiple documents to PDF I can’t isolate the documents to rename them separately. In other words if I put 20 different pages in at the same time, I want to go through them later to name and reorganize them. However, I can’t segregate the pages. Can I do this with the regular scansnap? I’m thinking of buying it. I don’t want to have to go back and forth after each scan. I’d prefer to scan now and organize later. How do I do this using the regular non-Evernote Scansnap? Evernote has the annotate feature that allows me to delete pages, but its very cumbersome to organize them. I’d like to do that from the computer after scanning all the docs. I hope this is understandable. Ginny, you’ll have to buy Adobe Acrobat Pro (or whatever it is these days). I use it almost daily. The primary advantage is being able to create and modify PDF’s, including adding or exporting pages. Check out the Adobe website to see what suits your needs the best, and good luck! Thanks, Doug! I’ll look into it. I think it’s $24 per month, though… yikes. You can also try a free tool, like the ones available on SourceForge, to split / merge PDF documents. I don’t personally own a ScanSnap since my budget doesn’t allow it, but we use them extensively at work. I have tried the EE edition, as a friend of mine owns one, and found that since the hardware is the same, the scanner functions as it should thanks to the use of the same drivers. The difference is the software, and from my experience, I have never really cared for bundled software. It is certainly possible to use any scanner and not use its software. Windows and Mac can natively “manage” scans. I’m a Mac user so automation is simple with Automater and Hazel. One can automate Windows tasks, though I’m not familiar with those methods since I prefer no to use Windows. I’m curious what methods Windows users employ to automate the process. Looks like they are trying to control the narrative and its all damage control. We shall see what 2017 brings. Stay away from the Evernote Edition and spend the money on a true non-OEM SnapScan product from Fujitsu. Evernote has lost its way and have stopped developing on pretty much everything. Evernote will not be around much longer. I already have several regular xi500 in my office. If I buy the evernote edition (it’s cheaper) and I plug it into a computer that already has the regular ix500 software, what happens? You can’t use the regular iX500 software with the EE scanner (last time I checked). You’ll have to install the EE software for it to work. They can both co-exist on the computer though. Works fine for me. I thought I had found the solution & downloaded that software. It didn’t work. I spent hours researching this, etc. I’m researching NOW to see if this has been updated. Don’t waste your time or money on the evernote edition. This version is a time WASTER not a TIME SAVER!!! I’m so annoyed I spent so much $ on this…& I either have to stand there and scan one document at a time, or go into the pdf and separate each one. Wasn’t the point of this edition to save a step as it does all it’s filing for you??? NOPE! NOPE! NOPE! The solution is to spend MORE TIME learning how to manipulate PDF’s. I’m just a teacher, mom, & small business owner trying to go paperless. I don’t need another career. 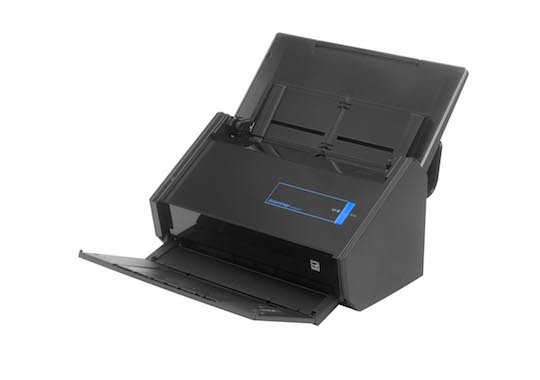 I never thought I’d say I miss my Neat Scanner, which doesn’t need to be connected to a computer and can scan a batch of papers and make individual docs. or one big one…UGH. I literally avoid scanning now, I’m back to a stack of papers. Good Luck. Thanks for the article, this helps with my purchase decision. Does anyone have any news of a new model coming? The iX500 has been out a good few years now, so this might be worth knowing about before making a new purchase. Multi-device usage without having to manually plug-in and switch the main host device (i.e. proper both wireless+wired network usage — ALL my host machines Mac/Win/iOS/Android should be able to use it ad hoc when needed). Make it a bit bigger on it’s length by a few centimetres, to allow easy native A3 scanning (loading docs in landscape, rather than portrait) instead of having to fold A3’s while using those clear carrier sheets (often not acceptable to do with sensitive docs), which is cumbersome. ….and before anyone says “try the SV600” model: it’s still pretty expensive, and gives mixed results, often due to external lighting conditions. 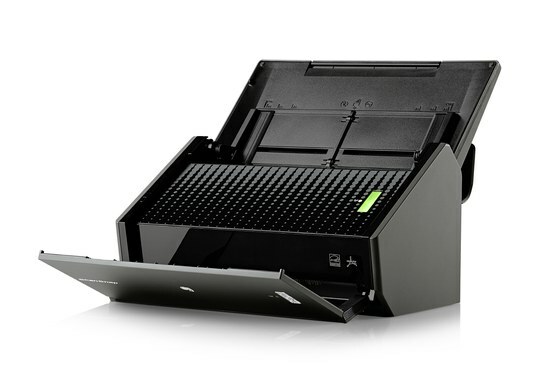 Why are A3 Plus flatbed scanners so hard to find without spending thousands, one wonders? Probably other things as well, which I can’t think of off the top of my head, lol. Don’t get Evernote Edition. The EN software has been flakey, and to make it worse, EN failed to support issues with it whatsoever. Read both the EN forums and others online, and you’ll read users complaining they’ve therefore been left high and dry with their EN Edition machine. They also could not return it for refund for reasons unknown, so they generally regret buying it, usually wishing they’d gone for the standard model instead. Oh, and in case you didn’t notice, the EN Edition is significantly more expensive to begin with, yet with less overall normal non-EN functionality outside of the EN stuff (which as I said, has questionable use anyway, given it’s flakey software and lack of support for issues). A potentially good idea, failed by the removal of standard functionalities, in favour of only EN ones with a complete lack support when things go wrong. Thanks for the report. I’m hoping that now that the scanner is sold (and presumably supported) by Fujitsu, the support situation will get better. We’ll see! I’m a heavy Evernote user AND a heavy ScanSnap user, so I briefly considered the Evernote version but quickly decided against it. 95% of my Evernote content comes from clipped web pages or notes that I type in myself. 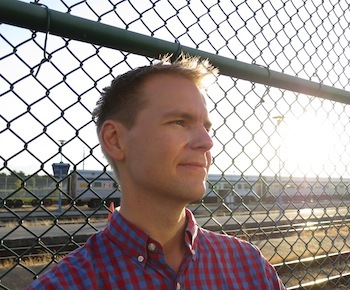 I rarely scan into Evernote, and when I do I don’t find it it to be all that difficult. I have a custom scan setting for Evernote, so that makes it pretty close to seemless when I do scan into EN. All of my ScanSnap scans (bills, financial statements, receipts, vital household and family documents) go directly into my hard drive, which is backed up to the cloud nightly. I “file” each scan into the appropriate folder on my hd and that’s it. While I see myself using EN for the long haul, I don’t trust its longevity, or any other type of proprietary software, for my household administrative documents. I certainly would invest additional money into further enmeshing myself into the Evernote system for vital documents.